Most parents looking to have their son circumcised just want it to be done as efficiently as possible, as speedily as possible, with minimal pain to the baby. Of course they'd prefer the circumcision be aesthetically pleasing, and that the circumcision heals sooner than later with no complications. When doing research about ANY mohel, the end results are important. (I've written elsewhere about the demeanor and the ceremony and the need for things to be done at your speed.) And most people leave the method to achieving those end results up to the mohel, and how he feels most comfortable getting there. However, there is not "only" one way to circumcise. And if it is important to you, it is important to ask about methods, and to inquire if the mohel can accomodate your desires. Please note that I use Method #2 presented below and as described at the end of this post. There are some methods which are questionable according to some (in some cases, many) rabbinic opinions. There are others which are standard - even if the "innovation" in them is "only" hundreds of years old. And there is old-school, bare bones (literally), which is advocated by few. Sadly, those who advocate the latter method often knock everyone else, even going so far as to declare other circumcisions "unkosher" and requiring hatafat dam brit - a ceremonial drawing of blood from the circumcision scar that would "kosherize" the bris. This is not only a form of lashon hara and rechilut (talebearing), but is a lie, a form of fear-mongering, and does nothing but increase hatred amongst Jews. The foreskin is drawn forward and removed. The membrane is often removed with the foreskin. If it is not completely removed, then it is torn and folded back beyond the glans. Finally, blood is drawn from the wound. In the interest of space, the methods described will not include metzitzah, which will be the subject of different posts. The foreskin and membrane are grasped with a hemostat and a clamp is applied to the foreskin. There are two kinds of clamps that have been utilized by mohels over the last sixty years. The first is the Gomco (on the right in the photo), which is often the method of choice for doctors in hospitals, but is not largely used by mohels. 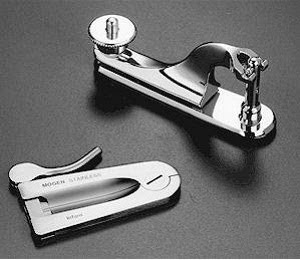 The second is the Mogen or Bronstein clamp (on the left), which is the method of choice for many mohels in the US (though most Orthodox mohels, including me, do NOT use it). The foreskin and membrane are then removed together in one incision, with a scalpel or bris knife. 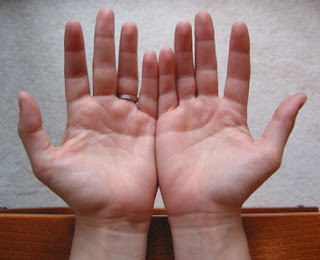 The foreskin and membrane are grasped either with a hemostat (as in method #1) or skillfully with the fingers. A metal plate with a thin slit is applied to the foreskin, leaving the foreskin resting above the plate, with the glans safely shielded below. A scalpel or bris knife is used to excise the foreskin. If the membrane is removed along with the foreskin, metzitzah follows. If the membrane is not completely removed along with the foreskin, it will either be cut with scissors, or the mohel will tear it with his sharpened thumbnails - in both cases to reveal the entire glans. Without using any device other than a blade, the mohel will estimate the length of the foreskin, grasp it with the thumb and forefinger of one hand and excise the foreskin with the knife in his other hand. Membrane removal will follow that of method #2. Metzitzah will follow. Obviously, the "con" of the baby having skin tissue removed and being subject to the pain of circumcision, and any bleeding are a given. If you are having your baby circumcised, it is assumed you understand that this is the down side (if you even view it as a downside) of the spiritual, national and Jewish significance attached to this procedure - which is the fulfillment of a commandment. The pro: Baby bears the mark of the covenant established between God and Abraham, and all of the Jewish people, which established God as our only God, and we, the Jewish people, as His firstborn, the chosen people who have a mission on this earth to spread monotheism and ethics to as many people as we can. * Usually a bloodless circumcision. * The mohel may not even need to use a bandage. * If applied correctly, the glans is protected. * The FDA has issued severe warnings about the use of the clamp, as it could grasp and amputate the glans or the tip of the glans. * Once the clamping mechanism is applied, the estimation of the foreskin is irreversible. Even if one were to remove the clamp and then reapply it correctly before excising the skin, the skin tissue that remains would be dead, and would liekly either become the equivalent of a growth or fall off on its own. * In order to achieve its desired effect, the clamp usually needs to be on for a significant amount of time - from 30 seconds to five or ten minutes. This is significantly longer than the next methods which take 3-4 seconds. * Rabbinic approval is scant. While Reform and Conservative mohels will often use this device, Orthodox mohels who use it usually do not have rabbinic dispensation to do so. Many will use it out of their own convenience (in other words, not because they have the baby's best interests in mind) so they need not come back and check the baby. This is not nice - every baby should be checked after the bris. No matter the method used. Those who use it usually swear by it. I think they feel this way because of the lack of necessity to follow-up. But I may be wrong. * While the foreskin is not crushed, it is squeezed tightly for a few seconds. The shield is an innovation which dates back at least four hundred years. It's purpose was (and remains) to protect the glans which is at great risk of being cut or amputated when a bris is done by anyone other than an extremely skilled operator. Like in the previous method, once the shield is in place, the actual removal of the foreskin - cutting along the shield, is the easiest part of the job. The only people who still do brisses this way are some Chassidic Jews. While each person is entitled to have an opinion, those who do it this way are the most outspoken about - and against - any other form of circumcision. You may have noticed that the con that reads "Estimating the end of the foreskin along the shaft is inexact" was on every "con list." This is because many mohels were never taught to use a surgical pen to mark the edge of the foreskin before beginning the procedure. If the mohel's initial estimation is marked with a pen or marker, the "con" is removed from each list, as long as the mohel makes sure to cut along the mark. I wrote about pain in the last few sections of this post. In simple terms, I think it is important to numb the area before the bris, but I think injections are not the way to go about doing it. There are topical methods out there that do just as good a job, and don't cause the baby pain from three "shots." In addition to marking the end of the foreskin, I use Method #2 for a host of reasons. While I personally do not agree with methods #1 and #3, I believe that the bris is kosher if the operator is fit to be a mohel. I also think that parents should know what they are getting in to when hiring a mohel, and that the method which best suits your needs should be employed for your son. When I circumcise, I aim to remove the foreskin and membrane at the same time, to minimize pain to the baby and the need to bother him too much. I always check the baby later, either a few hours after, the evening after, or the day after the bris. I wear gloves. I package all my instruments and bandages and sterilize everything in an autoclave machine - unless it is sterile in its packaging, e.g. gloves and drapes.